I've been listening to the news about the shooting at VA TECH. I just wonder what is going on in our schools now days. School should be an enjoyment to go and learn and look forward to the future. The worst thing I can remember happening at school is somebody getting in a fight in the hall way or meeting after school somewhere. It really scares me to see all this going on. I do believe it scares us all, Glenn. Thanks for checking in with us! 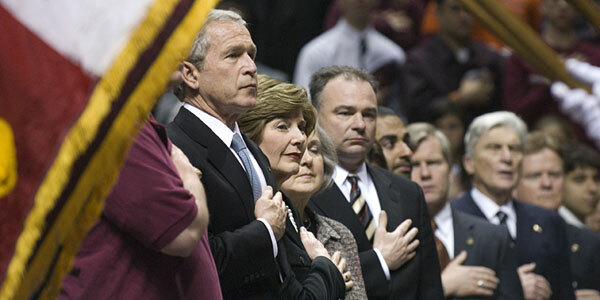 Virginia Tech is where I went to college, it’s where my brother went to college, it’s where my sister went to college. We all went there and the decision was a no-brainer. There wasn’t another school in the country we wanted to go to. Today, I’m wearing orange, one of Virginia Tech’s colors. The school colors are actually maroon and orange. I remember in college, and we didn’t love the color scheme— we thought the two colors clashed. Today, there is not another color I would rather be wearing. When you go to Tech, it’s in your blood. I think of the kind of camaraderie and the pride -- they call it “hokie pride.” It sounds corny, but it is how proud the students are of their school. But Virginia Tech is a place away from the big cities. It is away from the big city problems, away from all of it. It felt insulated. It felt safe. I never felt uncomfortable walking on that campus. Then to hear what happened at Tech today, at my school. I couldn’t believe it—I still can’t. It was all just so surreal today to see the images on television. You can’t help but look at those images. I have a girlfriend that’s a professor there. Was that her being carried out on a stretcher? Is she safe? I have friends who work on campus, friends in the communications department. The school always meant something really warm and fuzzy to me. Today, I have a horribly sad feeling. But I’m really hopeful because out of the worst tragedy, you watch people rise up. And it will happen on the campus of Virginia Tech. Those students will rise up. I’ll bet on that. I have been following the news closely and am relieved to report that so far, none of those involved are known to me or are children of anyone I know personally. Please feel free to share with me any personal reflections on the tragedy. I did read a personal reaction article in the Roanoke Times this morning that captured many of my thoughts. As I read it, my emotions welled up for the first time to the point that I found myself having difficulty focusing on the text and realized that the tears which signify the welcome emotional release that accompanies the beginning of the healing process had arrived. Feel free to share my thoughts and the attached copy of the Roanoke Times article with others. I was driving to work at midmorning on Monday when my mobile telephone rang. A friend informed me that a gunman had opened fire at Virginia Tech and people had been injured and possibly killed -- 33 killed, it would later turn out, and at least 15 others injured. As soon as I could, I called my daughter, Katherine, on her cell phone. She answered promptly in her dorm room, sounding tired. A late sleeper and a second-semester freshman at Virginia Tech, she knows the ropes: Her first class on Mondays starts at 4 p.m.
Katherine had heard about the shootings from her roommate. "Why did this happen?" she asked. What do you tell your 19-year-old daughter with the kindest heart of anyone you've ever known? You say you don't know. You say some people are sick, and some get sick -- maybe from academic pressures, maybe from broken hearts, maybe from things we can't begin to appreciate. You talk about kids on other campuses who kill themselves in a variety of ways, and how it happens every year. "But they don't hurt anybody else," she said. 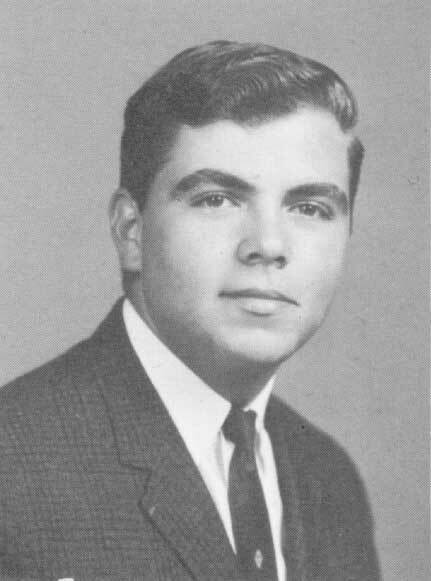 You talk about Charles Whitman, the student who climbed the tower at the University of Texas in Austin in 1966 and opened fire, killing 15 people and wounding 31. But that is too distant in miles and years to be relevant. You mention Columbine High School in Colorado, where, in 1999, two students shot 12 classmates and a teacher to death and wounded 26 others before committing suicide. 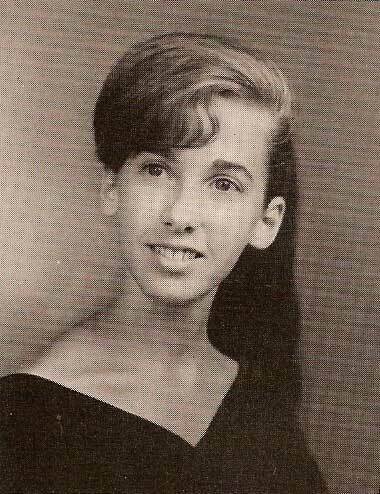 "That was high school," Katherine said. "This is college. There's no drama here." Then you tell the unvarnished truth: Drama exists wherever people are. We should not live in fear, but we should remember than anything can happen at any time, anywhere. Virginia Tech was Katherine's first choice of college. She studied ferociously to earn acceptance to it. I supported her fully. Her brother, Michael, graduated from Tech in May 2006, and recently returned to Blacksburg to work for a company in Tech's Corporate Research Center. He's thrilled to be back. But Monday morning left us and a lot of other people nonplussed: How could such a terrible thing happen in such an idyllic place, at a school that, Michael says, every student seems to love? Tech has more than 25,000 students. Yet it is known for feeling small. At freshman orientation, Tech officials come across as warm, smart and unpretentious. They emphasize their willingness to do what it takes to see that each student graduates. Other news stories may question the handling of the initial shooting, and wonder why classes weren't canceled immediately. But this story is not about that. As far as we can surmise, it is about an armed individual who used at least two handguns to kill 33 people and wound others -- the worst mass shooting in American history. It is about students jumping from windows to escape the horror. It is about the innocents who did not escape, and their families and friends. Despite its size, Tech seems to win over whole families and welcomes them into the larger Tech family. On Monday, I received telephone calls and e-mails from relatives, friends and the parents of other Tech students in Georgia, North Carolina, Michigan, Maryland, Texas and Tidewater Virginia. The Tech alumnus who is the father of Katherine's first-semester roommate sent an e-mail from his office in Newport News, asking about her safety and saying that he was crying as he typed. My daughter and I spoke again. All of her friends appeared to be safe, she said. Angry at the person who did this thing. Angry about the people who got shot. Angry about the helplessness that other students, and their parents and friends, felt. Angry at the stain on Virginia Tech's name, at the unavoidable future mentions of this episode at otherwise joyful events -- commencement in May, the first home football game, next summer's freshman orientations. This occurrence is part of Virginia Tech's history, bigger than the academic excellence, bigger than the bowl victories, bigger than the war heroes honored at the War Memorial beside the Drillfield. And everybody, from the oldest alumni to the youngest freshmen in their dorm rooms, wants an answer to the unanswerable question: Why? Thanks, Joe. I had no idea you had a daughter at Tech right now. Our thoughts and prayers are with you and your family. My daughter, who is a sophomore at Smith College, sent me this poem yesterday. Thanks, Chris. That's quite moving. Please pass this around to those you know in honor of the students whose lives were saved and in memory of the faculty/students whose lives were lost. In moments like these, it makes us realize how grateful we are to have each day to live. It reminds us to enjoy our lives with the family and friends we have made and to never take it for granted. You never know what can happen a minute from now, an hour, a day, or in the next couple weeks. 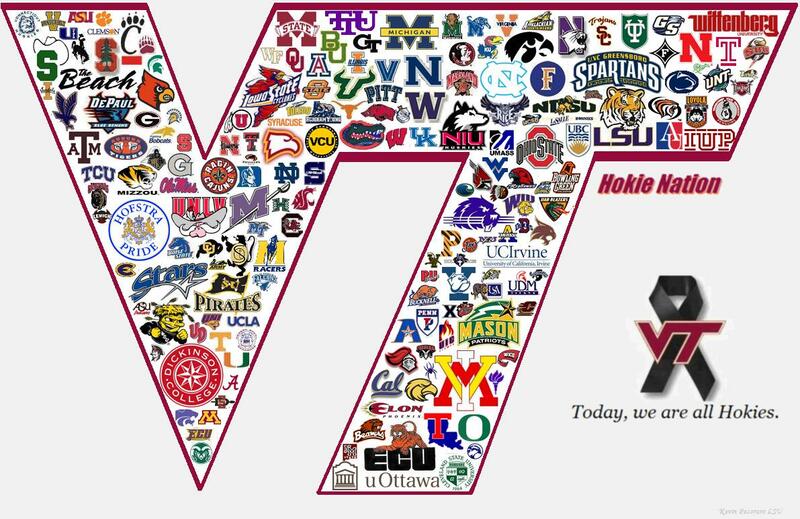 Pass on this symbol, post it where you can and remember our fallen Hokies who lost their lives tragically yesterday! 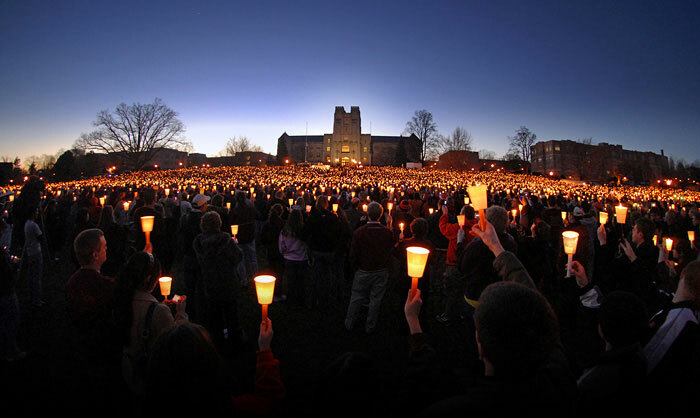 Together we will unite in a way that only Hokies can do- through that strength we will mourn this day- look for a brighter tomorrow and inspire the country in our bond! "We are sad today, and we will be sad for quite a while. We are not moving on. We are embracing our mourning. 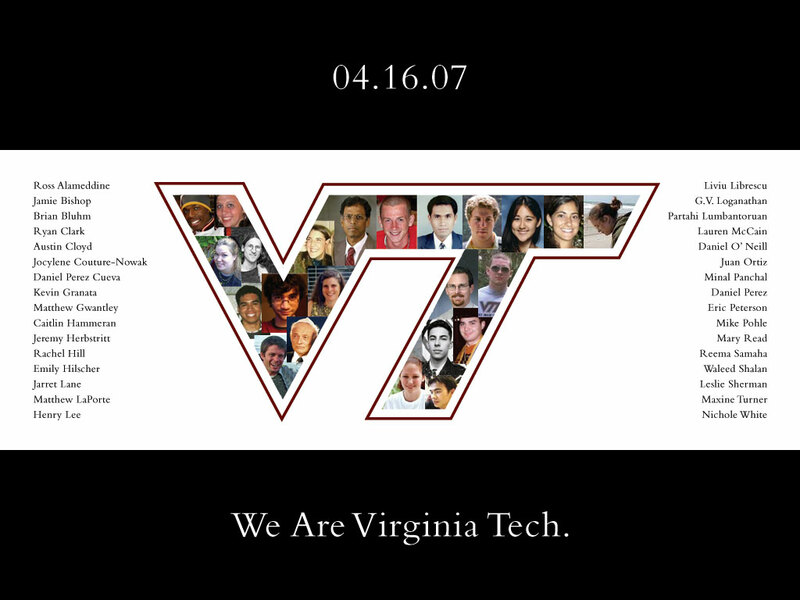 We are Virginia Tech ..."
I am still numb following the events of 4/16 ... it is beyond comprehension. Like many of us, I have friends and acquaintances that either went there or are currently there. 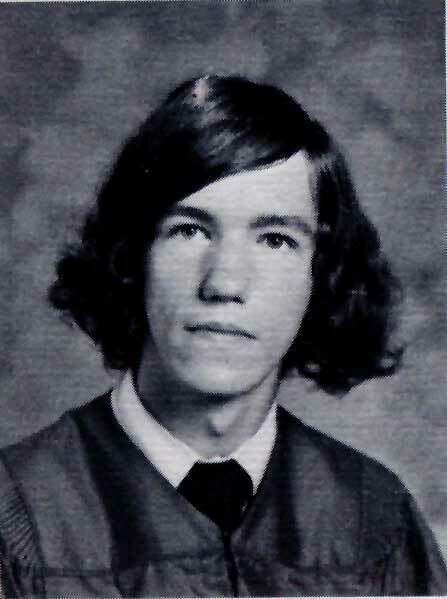 Tech was my first choice for post-HHS education but we could not financially swing it so it was Tommy Tech for me and a hands-on career in electronics which allowed me to back door into a job as Engineering Coordinator at Surry Nuclear Power Station. I dated a HHS/Tech graduate during the mid 70s, my manager is a Tech grad, many Engineers as well as our Chief Nuclear Officer ... the list goes on. One of my Monday duties as Engineering Coordinator is to ensure that the EMOC (Engineering Manager On Call) name and phone/pager numbers are correct for the week. 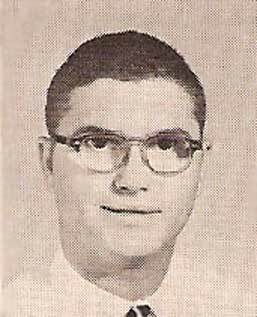 10AM ... verified that Bill Webster's info was correct as EMOC for the week .... 12 noon I learn he has left work and is on the way to Blacksburg with his wife after receiving word that one of his two sons (who both attend Tech) was shot in the arm and taken to the hospital. I scramble to find a replacement EMOC and make corrections prior to publishing of our daily work schedule , not knowing the full story and how high the death toll would escalate. At work there is normally lots of good natured Hokie bashing ... mostly by UVA grads ... kind of like Crabbers vs. Typhoons. But this week we are unanimous in our pain and support. 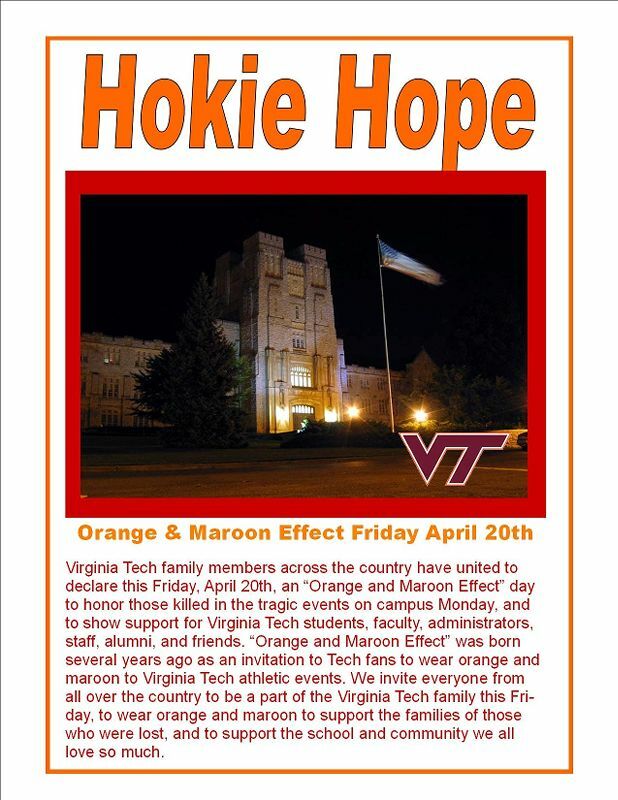 This Friday there will undoubtedly be die hard Wahoos wearing maroon and orange in support ... something not normally seen unless one lost a jersey bet on a ball game or something. This time we ALL lost. My thoughts and prayers to all affected by this terrible tragedy. Not that it excuses it but this clip shows a disturbed mind. Some of you may have already seen this. I had not. Thank you, Shari. I was indeed watching this last afternoon and evening as it unfolded. HAMPTON - Lauren Ashley McCain, 20, a Virginia Tech freshman, entered into the place prepared for her by the 'love of her life,' Jesus on Monday, April 16, 2007. Born Dec. 20, 1986, she is the daughter of David and Sherry McCain of Hampton. In addition to her parents, her brothers, Joel and Christian, and her sister, Abby, survive her. 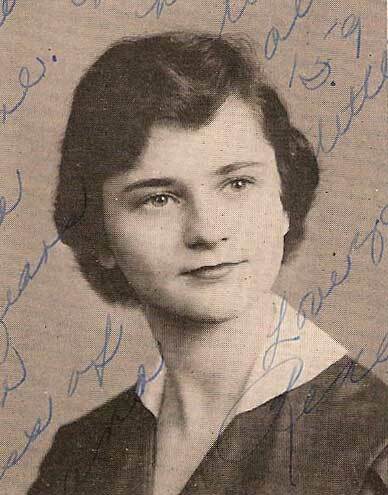 Her loss is also felt by her maternal grandparents, Robert and Louella Pickard; paternal grandmother, Ruth Ann Boydstun; maternal great-grandmother, Fern Martin; aunts, uncles and cousins who love her deeply. Lauren's life was characterized by her unwavering commitment to serve her Lord and she radiated the love of Jesus that touched everyone who knew her. Lauren attended grade school in Stillwater, Okla., and she began her relationship with Jesus Christ while attending Hillcrest Baptist Church. 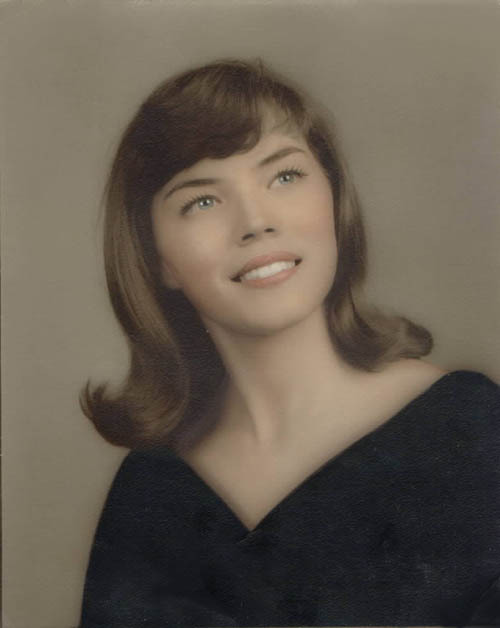 Moving to Jacksonville Beach Elementary, she continued to grow in the Lord at Mayport Naval Station Chapel, Fla. She attended Junior High in Portland, Texas, attending First Baptist Church. Moving then to Hampton, Va., Lauren was schooled at home participating in Restoring Moms co-op for high school. She was actively involved in the youth and drama ministries of Restoration Church, and then entered Virginia Tech which she thought of as 'almost heaven.' She was also involved in Campus Crusade, Bridges International Ministries and [nlcs] the church on campus at Virginia Tech, where she touched many people with the love of Christ. It was from there that she entered her heavenly home. Her family and friends cherish wonderful memories of this beautiful, sensitive and caring young woman. The family will be receiving friends from 6 to 8 p.m. Saturday, April 21, at Restoration Church-Phoebus Baptist, 508 Foxhill Road, Hampton, VA 23669. A celebration of her life will be at 2:30 p.m. Sunday, April 22, at the church. Interment will be in Shawnee, Okla. In lieu of flowers, donations may be made to Restoration Church to go towards Christian's and Abby's college education and for Lauren's desire to fund an International Studies student at Virginia Tech. Arrangements by R. Hayden Smith Funeral Home, 245 S. Armistead Ave., Hampton, VA 23669. Published in the Daily Press from 4/20/2007 - 4/21/2007. SMITHFIELD - Nicole Regina White, 20, of Park Place, died Monday, April 16, 2007, on the campus of Virginia Tech. 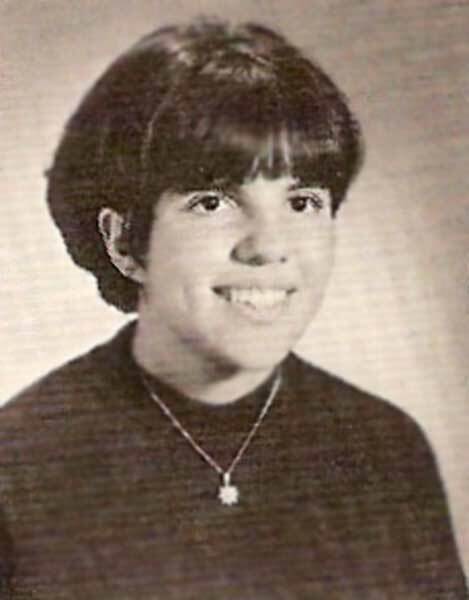 A native of Portsmouth, she was the daughter of David Mike and Tricia R. Gallagher White. Nicole was a Junior at Virginia Tech, a member of Nansemond River Baptist Church, a lifeguard at the YMCA in Smithfield and an EMT with the Smithfield Volunteer Rescue Squad. She also volunteered at the Blacksburg Animal Shelter and the Women's Abuse Center in Blacksburg. Besides her parents, she is survived by a brother, Evan White of Smithfield; a maternal grandfather, Mark L. Gallagher and his wife, Eileen, of Point Lookout, N.Y.; a paternal grandmother, Rozelia 'Petesy' White of Portsmouth; and numerous aunts, uncles and cousins. 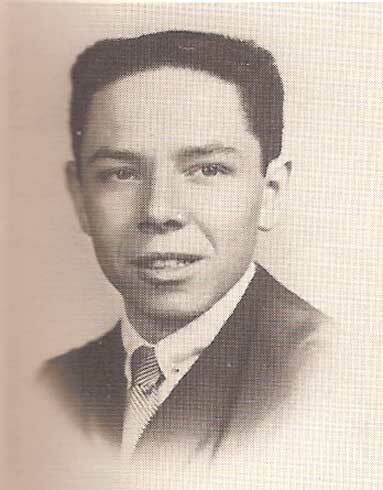 A maternal grandmother, Patricia Gallagher, and a paternal grandfather, David R. White Jr., preceded her in death. A funeral will be at 11 a.m. Wednesday, April 25, in Nansemond River Baptist Church by the Rev. Tim Piland. Burial will be in Meadowbrook Memorial Gardens. The family will receive friends at Sturtevant Funeral Home, Bennetts Creek Chapel, Monday and Tuesday evenings from 6 to 8 p.m. In lieu of flowers, memorial donations may be made to an Animal Shelter of choice or the Women's Resource Center of Radford, P.O. Box 477, Radford, VA 24143. Published in the Daily Press on 4/21/2007. It is a very nice remembrance. Yes, it is. Thank you so much, Judy. For some reason, the first song which came to mind was "Into the West". As I listened to the MIDI version, I was struck by its sadness wrapped in hope. The organ accompaniment in the refrain transformed it into a hymn. I was going to suggest omitting the lyrics, but as I read them, I changed my mind. I think they are quite apropos. I think you're a genius, Sir - Thanks!